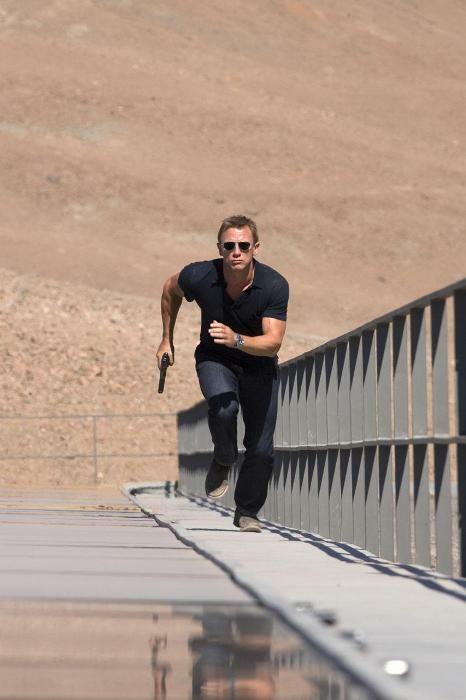 Quantum of Solace: Rough Around the Edges and Liking It | Phil-zine! The new Bond film, Quantum of Solace, has a really slick energy behind it. At moments almost a little too stylized for it’s own good, but I’m not complaining! I like style, especially when there’s an intriguing story, and this particular one picks up right where the last one left off. Finally a soap opera for dudes, that doesn’t include the Saw films. And who doesn’t want to see Daniel Craig grow into the role of the Bond we remember, and when we get to the Bond we remember, will we want him again? (Judging by other reviews they’d rather have a character that feigns emotions, rather than has them!) This new Bond…rebooted Bond…is so intriguing and driven. Craig adds more nuances to Bond than most actors do with “serious” roles. Driven by things he doesn’t quite understand himself. Calculated coldness and emotional turmoil and he’s still got a sense of humor that pokes it’s nose through on occasion. And sometimes he doesn’t say anything at all. What can he say? If you don’t remember Casino Royale, this is an injured man. Bond has, if nothing else, become aware that he’s a brute. He’s a machine, that cares. When he’s killing people or getting people killed, remorse begins to creep in. A sense of duty over survival. Bond is growing, learning. Sometimes because of tragic consequences. The one relationship that holds the center of the movie isn’t Bond’s relationships with the young beautiful women (a very beautiful one in this case played by Olga Kurylenko – who has her own story! ), but with M, his superior, played so naturally by Judi Dench. Their Mother/Son back and forthing creates a center rich with humor, doubt and compassion. And along with this maturing Bond comes a highly mature sense of filmmaking. You’re not watching a typical Hollywood story unfold, but a character driven action fest. Marc Forester, the director of a lot of indie-like films, some of which I’ve really liked (Finding Neverland), some of which I thought were incredibly overrated (Monster’s Ball) and others complete hog wash (The Kite Runner), has followed the previous Bond’s mixture of art and entertainment with a little more 70’s art verve! The action sequences at the end of Kite Runner worried me the most. They were about as hammy and well choreographed as a bad 80’s movie. When I heard Forester’s hand was on the Bond franchise’s steering wheel, I got really worried. There’s no need to worry. The action, while sometimes bordering on abstraction, is clever, effects the characters and is full of incredibly powerful imagery. These sequences sit with you. They don’t just roar noisily by only to be forgotten about a week later. They build and grow with the film, until a climactic battle in a complex shakes the characters’ foundations! Like the Bond films I grew up with, you feel like he was truly globe trotting. Forester gives us so much detail and mise en scene that the journey truly is a journey. The joy of being a secret agent encapsulates you. It’s not just about smooth action and witty repartee that was becoming very cardboard with the Brosnan Bond films, but it’s about not knowing who to trust. The elitists in this film are frighteningly elite. You even get the sense that Quantum of Solace is holding back a little. Saving itself for future installments. While our villain is conniving, there’s someone out there that’s even worse. And in a world like the one we’re in, when the lives of 95% of the planet are decided upon by the wave of a hand and the signature on a document of one of these self-proclaimed elitists, normally with the exchange of money in mind, it makes Bond that much more relevant and a hero for our times. He’s fighting the people we wish would just disappear, but first he has to find them. This entry was posted on November 19, 2008 at 11:57 pm and is filed under Current Movies and Reviews. You can follow any responses to this entry through the RSS 2.0 feed. You can leave a response, or trackback from your own site.